This month I am guest host at Salford Museum and Art Gallery craft social. 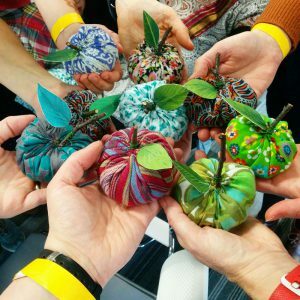 I will help you create a beautiful fabric apple to use as a paperweight or pincushion. Encase a secret message at its core and embellish with embroidery and beads. The craft socials are an opportunity to have a chat with fellow crafters and try your hand at a new craft. Cost includes a hot drink and all materials. Check out the Salford Museum website for future sessions.